Join the discussion on our forums! Come discuss Unseen Saboteur over in our dedicated Unseen Saboteur discussion topic. Battlecry: Your opponent castas a spell from their hand (targets chosen randomly). Far more effective than the flamboyant saboteur. Thing with this card is, a lot of spells are always good for the guy that casts it (case in point, giving someone a free Nourish or Arcane Intellect), and you're not always gonna go up against a combo deck, and unlike minions which can be removed, you can't stop the spell effect. Still, I'm waiting for the day this guy makes a Hunter Kill Command his own Highmane. Or his own face. Even outside combo matches the effect is pretty useful. For example, you can make a Warrior waste a Brawl or a War Path, you can make people waste removal on their own minions or face, you can even make them use their buffs on your own minion or waste a mass buff on an empty(ish) board. There are moments where it'll backfire, sure, but overall I'd say this card is very much worth running in any control deck. Maybe there is some sinergy with lorewalker Cho? I don't think it works that way. Of course, I've been wrong before. 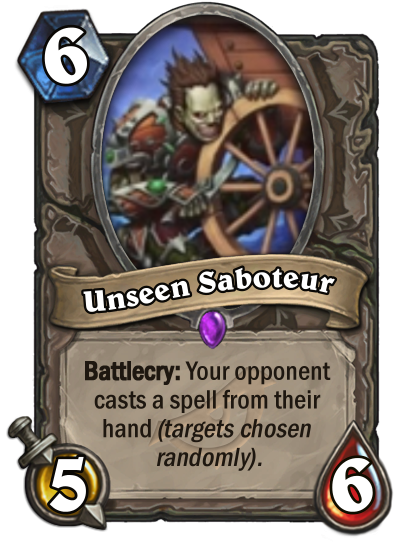 EDIT: I just realized you can put stuff in your opponent's hand and make them cast it. So yeah, maybe. It costs 6-mana. By turn 6, your opponent will not have cheap spells (already played), and most certainly he is already drawed big spells, like The Boomship, Mass Resurrection, Power of Creation… too scary to play. You need to wait for release, comments will come once combo babies get salty of losing their key pieces.